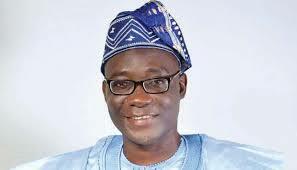 Deputy Governor of Ekiti State and candidate of the Peoples’ Democratic Party (PDP) in Saturday governorship poll, Kolapo Olusola has rejected the results of the poll as announced by the Independent National Electoral Commission (INEC), which declared All Progressive Congress (APC) Kayode Fayemi as winner. Olusola justified his claims with allegations of intimidation, oppression and inducement by security agents which he claimed aided and abetted APC’s alleged manipulation of the electoral process that all gave Fayemi the victory. He declared his rejection of the poll’s result to Nigerians, Ekiti people and the international community, saying: ” You are all aware of the unfortunate and dangerous events of the past 24 hours, in which our governorship election was hijacked by political desperadoes leveraging on “Federal might” to pervert the electoral process, subvert the will of Ekiti people, and viciously steal the mandate willingly and freely given to me on a massive scale by our people. PDP and I won the election overwhelmingly, receiving more than 70% of lawful votes cast and winning in almost all of the State’s 16 local government areas. I therefore reject the falsified results being bandied by the Independent National Electoral Commission, which purportedly gave the election to the All Progressives Congress and its Candidate; Dr. John Kayode Fayemi,” he said. Olusola described the alleged manipulation of the poll as:” most audacious electoral robbery of our recent history”, which: “shall not stand”. “INEC on its own part reneged on its promise to have results counted, declared, and pasted on the wall of each polling station. There was nowhere INEC transmitted results from the polling centres as earlier promised. Ballot boxes were illegally moved to INEC offices while our agents were disallowed from following the process. ” INEC also allowed late voting by APC in hideouts when it was obvious the figures still would not add up after all the infractions mentioned above. Still, when all of these shenanigans still failed to give them the figures they needed, they stopped the announcement of results ward-by-ward, caused a deliberate power outage at the collation centre, with no alternative source of power provided for a long time, and then wrote results in favour of APC and its candidate. “Without doubt, what has played out in Ekiti is the APC template for the 2019 General Election, where they have mapped out Rivers and Akwa Ibom as States they must capture at all costs, like they are now trying to do Ekiti. It is now left for the opposition and opposition figures, most especially presidential hopefuls in 2019, to stand up to be counted in the struggle to roll back President Muhammadu Buhari’s creeping fascism, or throw in the towel without a fight. ” This is not just a sad day for Ekiti but also for democracy in Nigeria. Nothing demonstrates this better than the gloom that has enveloped our dear State since they announced their convoluted result. Ekiti mourns! But I ask our people not to be despondent but to keep hope alive, quoting the inimitable Chief MKO Abiola. This is another battle we will fight and win. “In doing this, however, I appeal to all Ekiti sons and daughters to eschew violence. They will try and provoke you but the good Lord will help you to keep calm. Taking a cue from our great leader and democrat par excellence, ex-President Goodluck Ebele Jonathan, I wish to reiterate that my ambition is not worth the blood of a single Ekiti son or daughter. We are not cultists and bloody hounds like them and shall therefore not allow them turn Ekiti into a killing field like they have done in the Middle Belt. “It remains for me to thank Ekiti for standing by me and our great party. Our royal fathers and the Oloris, teachers, civil servants, Okada riders, Labour leaders, market women, artisans, and students – I appreciate your unflinching support. We thank every Nigerian desirous to see the growth and defence of our renascent democracy.